could someone possibly help me identify what knives these are? would like to grab a couple of these. Kunai leaf style though much better quality than these. duly noted. any clues on the manufacturers though? Haha just search for Kunai on google. You can find a bunch of websites that will sell you some. And, advice I like to give to anybody reletivly new to the forum: If you have any more questions, be sure to use the search feature to see if your question was already answered in another post. I was hoping to get the specific ones lol. I'm sure there are fairly many who made kunais, but I just want these exact ones. 3 for $40...good price in my opinion. Hm. You can get some for a cheaper at trueswords.com. Not sure about the quality of them. I know you can get a back of 12 smaller ones for, I think it was 20 dollars. All that Ninja fashion is just that. The big ring on the bottom makes it hard to release. I think these are smaller, 6 1/2 inch long $15 for set of 3. I just buy cheap japan sykes fairbairn commando knives. they bend instead of break, they weigh about the same. you can throw them blade or handle release. sometimes on ebay for cheaper. sometimes I take it off. all you need is the point. i bought a twelve pack of smaller versions for about twenty bucks, they are great knives, but it takes a lot of pratice with them because they are so unique as knives. the downfall to them is that the string handle comes off very easily basically throwing off the balance of the blade. 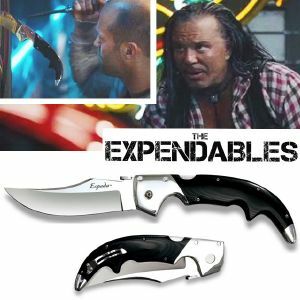 Linda Hibben contacted the production people regarding these knives, as Gil did the big pieces for the film. "OK, bad news........from what I can find out, the throwers were made by or provided by a prop company especially for the film and they are not available for sale. It is my understanding the prop company is called ISS." I got a set to test; throw perfectly fine, but ridiculously thin!!! Definitely designed for soft targets or flesh, not any kind of wood target as they will bend, warp, chip and be useless. Really great for close quarters hand-to-hand tho. Just like the throwers that Lee Christmas uses in The Expendables movie, this set of three throwers is perfectly balanced and amazingly accurate! This throwing knife set features three perfectly balanced throwing knives constructed of single pieces of anodized AUS-6 stainless steel. Each thrower measures 12 inch long and features an anodized double-edged, stainless steel blade with a black cord-wrapped handle with a finger hole. Included is a custom nylon sheath with boot loop and leg strap for multiple carrying options. $30 for three 12"knives...not a bad deal. I read a bunch of the reviews, other than the wrapping coming off it seems like the reviews were all positive. I have a bunch of the little 6" of this style, I just covered the wrapping with super-glue. I had a couple that started unwrapping so I just glued them all. I might buy this set just to see how they throw. The big ring on the end will hinder a smooth handle release, but might make for some fun spinning. The Cold Steel Espada, pretty sure the one they threw was the medium though which I do not own. When they invented kunai no one known that This masonry tool will be thrown like a weapon.